In 2006, comedians Michael J. Nelson, Kevin Murphy and Bill Corbett re-imagined their cult legacy series Mystery Science Theater 3000 as a new show for a modern, digital world. RiffTrax explored a number of forms over the years, include a brief foray into physical DVD releases, but finally settled on a streaming/download/syncing system that serves their audience exceptionally well. They’ve built a new empire from putting together regular releases through their website and subscription service, along with live events broadcast into theaters across the country via Fathom Events. There’s a real magic in the live events, between the crowd joining in on the joy that comes in waves of raucous laughter, and getting to see the performers on screen, no longer just mealy shadows in an empty space station. Also, getting to see them read from a script is a nice reminder of the hard work required to do what they do, and I think that helps lift the comedic plague in ways that might make Aliens vs. Predator sequels safe for future generations. 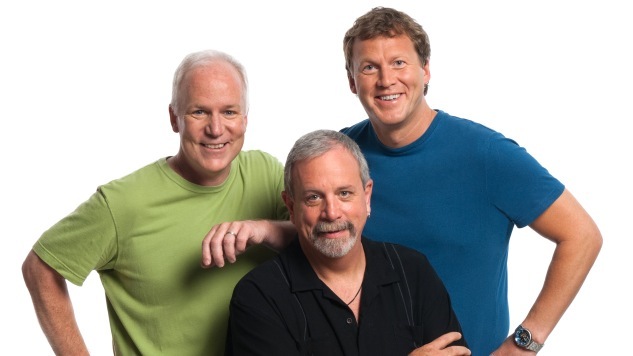 Here’s my conversation with the RiffTrax guys (Michael J. Nelson, Kevin Murphy, Bill Corbett) about talking cats and awful space operas. Paste: What do the next couple of months hold for you and what are you excited about? Michael J. Nelson: We finally secured the rights after all these years, it was a Herculean effort: we have Krull for our live show in August. A lot of our movies we don’t do live, because rights are such a nightmare. It’s rare that we hook into a major studio’s permissions, and we were able to do that with the Sony people, which is great. We’d done a few of their other titles and now they’ve trusted us enough to do… well, Krull. Paste: There wasn’t some director or producer associated with the film that made this a living hell for you? Some lone hold-out? Nelson: Director Peter Yates did pass away in 2011. So maybe there was something in his will that stipulated we had to wait seven years to take on his masterpiece? I don’t know. Paste: Krull is one of those Great Awful Classics that I still haven’t gotten around to seeing. I do know that it has a James Horner soundtrack, so that’s… that’s a thing to look forward to! Is the film one of those un-gettable gets for you guys? Is it the kind of thing you’ve been writing jokes for in your head over the years? Kevin Murphy: I’m excited for it because it seems to be an amalgam of science fiction and fantasy, made in the ‘80s, and all sort of mashed into one. There’s a bit of Princess Bride in it and James Horner’s soundtrack sounds suspiciously like Star Trek: The Motion Picture. It’s really strange and hard to follow. It’s such a mishmash and it’s really difficult to figure out the plot even after watching it several times. I don’t think any of us could sit down and walk you through the plot. Bill Corbett: I’ll be honest. I had never seen the movie before, and I’m amazed that it was a big studio movie. They got so much of it wrong. Everything seems to go on three times longer than it needs to and it really showcases what they thought were visual delights. Even giving a break for advances in CGI and special effects, everything looks quite bad. Paste: What’s the most fun part about doing the live shows for you? Paste: A sort of comedy cabin fever? Corbett: That’s a good way of putting it. And in Minnesota it’s real. Cabin fever gets real up here. Paste: Out of your most recent episodes, what would you recommend people check out? Paste: ... Ohmigod. Thank you so much for this gift. It… it is A Talking Cat?!? right? Murphy: It’s really, really fun and it’s so much different than a lot of these. We’ve been doing a lot of dreadful post-apocalyptic ‘80s movies recently, so this is a breath of fresh air. A breath of cat-scented air. That’s the tagline their PR missed. Corbett: Another one we did recently I’m quite fond of is Omega Cop, which is something of a cult classic, but it’s along the lines of the thing Kevin just described. It takes place after the Greenhouse Effect has devastated the planet and the whole movie is Adam West alone in a bunker. He never leaves the room and he gets very sweaty talking to a guy who does karate on the outside of the bunker. That’s the Omega Cop. But Adam West was the Name. Paste: Have you guys seen the trailer for Overlord yet? It’s a J.J. Abrams zombie Nazi grindhouse film. I just saw the trailer this morning and it uses “Hell’s Bells” and I thought it was a cheap choice but now I’ve been singing it all day. It turns out maybe I just need J.J. Abrams to remind me that AC/DC is good? Nelson: Oh, good. A movie based on a Call of Duty level that’s twelve years old. Murphy: The Nazis, themselves, were not bad enough. So they had to turn them into Nazi zombies? Lightweight. Paste: Well, to paraphrase the President, there are good people on both sides… of reanimation. Which, let’s use that as a transition. What sort of specific challenges do you face in the current political climate? Nelson: What we’ve been doing, we’ve been doing for so long, and we do what we do. We’ve always steered a pretty broad path, trying to appeal to the most number of people we can while still being as funny as we can. I don’t feel that it’s ever been an issue. We’ve always sort of have a loose agreement of let’s not put in anything pointed or political and if there’s a choice between doing something that might rile somebody up, why not just not do it? Because we’re so adept at changing up jokes that our next version of the joke would probably be better anyway. Murphy: We want to be around for awhile. And that means being a bit evergreen. So we never get way too topical except with goofy cultural references. If it won’t be funny, or make sense, in three years, why do it? So, uh, I think we tend towards being a little bit more evergreen. Corbett: I have to take a stand. I’m a little bitter that Mike and Kevin won’t let me do my jokes about Trump being orange because I don’t think that’s been pointed out. I think that’s the missing piece for our rocket ship to stardom. Paste: Right. There’s plenty of Bush Administration jokes that might not work now. But also, I mean, are future generations going to not get a joke about The Pee Tape? I feel like Pee Tape is forever, you know? Corbett: This is sort of my question. I find a lot of mainstream political humor kind of hacky and it mostly announces your allegiance rather than makes a good joke. And every now and then we do a surprisingly pointed political thing. I think it’s pretty ecumenical, but when we throw an elbow, I think we try to make it sharp and funny. Although for a while we were kind of obsessed with Ron Paul. But political jokes are claps you can get anywhere. Paste: So you have a loose agreement to avoid Please Clap jokes? Murphy: Yes. And I think for a big part of our audience we look like an oasis in the entertainment landscape. You can come here just to laugh and that feels like an important thing to be providing right now. Paste: Bill, you’ve made jokes about Pick-Up Artists and Gamergate and topics like that in a way that have made listeners want to know what made you aware of those worlds. Corbett: I was just in awe of that while it was happening. It was such a huge, idiotic thing that had no basis in reality. Big old nothingburger. But we’re entertainers and I think it’s a trap to think that we have any power to influence anyone’s politics. Paste: I regret lines that I said on stand-up albums one or two years ago. I cannot imagine what kind of regrets you have over jokes that you think have aged poorly in the decades that you’ve been doing this kind of thing. Do you ever want to walk jokes back, or apologize for them? Nelson: What you see is what you get. We’re not trying to do anything subversive, other than trying to make people laugh and then, you know, 10 years down the road something’s going to look like, wow, I can’t believe they made a joke about that. I don’t regret it. I think there’s been a couple of things where we’ve gotten too harsh on someone’s appearance or something and we’ve actually done public apologies for things like that. That’s more of a thing. Just like not, you know, try not to get too personal in somebody’s space. Sometimes there’s just a line that, a few weeks later, you wish you could have had another go at it. But otherwise, you know, I think Nick Nolte can handle what we throw at him. Paste: I don’t know if I’m just one of many to have brought this up, but one of my all-time favorite theater-going experiences was catching your live Anaconda broadcast a few years back. Do you have any personal memories about what might have made that event special? Corbett: I am really glad to hear you say that! I really enjoyed that one and I thought it was great fodder but it didn’t seem to make as much of an impression with our fans. I remember it very fondly because I think it was a great mixture of, you know, a snapshot of Hollywood at that moment, including Young Owen Wilson. Just to have Owen Wilson to talk about. That was the first Sony deal that we had worked out. I guess that proved we were good business for doing more with them. Paste: It was fun to be in a theater watching Anaconda on a big screen, so you can just really see where the CGI wasn’t finished, in a way that a small television just can’t translate. Corbett: At the time, I think we all felt there was something really defensible about that film. For a movie about a dumb snake and Jon Voight, it did have an actual structure to it. And we don’t always get that. It was a well done story and it was, at the time, fairly radical to have the survivors of a white expedition end up being J. Lo and Ice Cube. But yeah, Jon Voight was an absolute gift to us in that movie. Paste: There are a number of jokes about the usage of the illegal substance marijuana on your fine program. Do you gentlemen ever partake? Nelson: I have a shocking answer. Nobody believes me. I grew up in a Wisconsin dorm in the ‘80s and yet never in my life have smoked pot. So my references to it are all just from every other human I’ve ever known. And I have to say it’s not from a place of prudishness. I just found it like personally disgusting. The smell of it bothers me. I’m probably an outlier so I’ll leave it there. Murphy: I’ll say for me it’s been a long time, quite a long time since I used marijuana with any regularity. Um, I think in part because it became really expensive and, and it’s, it’s really difficult to figure out how to dose the damn stuff now. Most of the time these days I think I would just simply end up falling asleep and uh, and I can’t write, I can’t write when altered on anything but caffeine. But I will drink two pots of coffee a day. And I have no problem with that. Corbett: I’ve never really performed or written while high. I don’t mean to destroy the image. Nelson: We can wreck a hotel room, but it’s just due to our messiness. Paste: Finally, have you guys ever read Mystery Science Theater 3000 fan fiction? All In Unison: Oh god no. No. Hell no. AHHHHHHHHH. Oh my no. RiffTrax Live: Krull comes to theaters on August 23rd and 25th.